The EcoCity World Summit – a biennial cross-disciplinary gathering of all involved in building sustainable cities – is to come to Abu Dhabi city, the capital of the United Arab Emirates, in 2015. The Summit organisers, the Ecocity Conference Series Relay Committee, awarded the host status to the UAE capital after what it called a ‘clearly outstanding proposal’ submitted by Abu Dhabi Convention Bureau – a dedicated entity of Abu Dhabi Tourism & Culture Authority – in conjunction with the Environment Agency-Abu Dhabi, AGEDI, and with the support of Abu Dhabi National Exhibition Company and Etihad Airways. 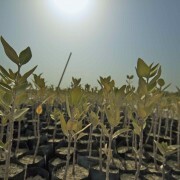 In 2006, Environment Agency – Abu Dhabi, in collaboration with AGEDI, issued the first State of the Environment Report (SOER), and it was immediately hailed as an advancement in data sharing. Now, working closely with EISOM, AGEDI will launch an online version of the SOER, called the National Reporting Toolkit. The Regional Organisation for the Conservation of the Environment of the Red Sea and Gulf of Aden held a two-day regional training workshop in Jeddah in September 2013. The workshop, titled “Assessment and Management of Blue Carbon Resources in the Red Sea and Gulf of Aden” aimed to share data on the Gulf’s Blue Carbon Ecosystems and how they support vital environmental functions. Huda Petra Shamayleh, AGEDI Co-Project Manager of the Abu Dhabi Blue Carbon Demonstration Project, gave a keynote presentation at the workshop, on the Abu Dhabi Blue Carbon Project. The presentation highlighted the Project’s research components and the findings from the various assessments conducted on the Blue Carbon Ecosystems of Abu Dhabi. The Environment Agency – Abu Dhabi (EAD) has joined the world’s largest nonprofit scientific and educational organisation, National Geographic, to help promote The Great Nature Project, an ambitious initiative designed to inspire biodiversity conservation efforts among the public, globally and across the UAE. EAD will champion the project in the UAE, and along with AGEDI and the Mohammed Bin Zayed Species Conservation Fund, will consolidate efforts to drive awareness on the project through their collective local, regional and international networks.